Was it me, or did January 2019 fly right by? In my recent conversations with business owners and entrepreneurs, some feel a bit behind in keeping up with their 2019 goals. Things in business sometimes do not go as planned, and that is why flexibility and resilience are incredibly important traits to have – and call upon – in the world of entrepreneurship. In this week’s Small Business Accelerator, I share some solid content on innovation, and resources for understanding and learning about trends in the marketplace. Many areas of the economy remain ripe for disruption, and existing businesses can always innovate to gain a competitive advantage. I always love a great entrepreneurial success story, and I’ve selected a few that provide inspiration and practical know-how. Enjoy these resources, and keep moving forward! 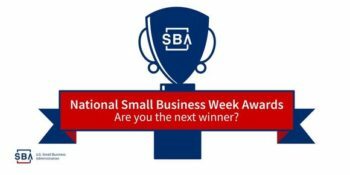 The U.S. Small Business Administration has extended the deadline for the 2019 National Small Business Week Awards nominations. Now, all nominations must be submitted no later than 3 p.m. EST, February 4, 2019. All nomination packages must be hand delivered or mailed to the nearest SBA Office. Email submissions of SBA Awards forms will not be accepted as they contain personally identifiable information (PII). And much more! Register for FREE, or learn more here. 5 Money Moves Your Business Should Consider in 2019, American Express. For entrepreneurs and business owners, the beginning of the year is a great time to review your financial habits and situation to help you earn more and leverage current resources. Five options are explored in this piece: From utilizing key provisions in the “Tax Cuts and Jobs Act” to lining up funding ahead of time rather that when you hit a cash crunch or need immediate resources to expand, the advice provided by these experts can help you stay ahead of the game in 2019. Learn more, or Register for FREE here. Do consider supporting our important work protecting small business and promoting entrepreneurship.